W. W. Norton & Company, 9780393241075, 273pp. While other chefs paid dues on restaurant lines and at cooking schools, Brooks Headley was in the back of a tour van as a drummer in much-loved punk bands that never made a dime. Former executive pastry chef at New York's Del Posto restaurant, Headley created unorthodox recipes that echoed his unconventional background: fruit was king, vegetables were championed, acidity was key, and simplicity was the goal. With 97 recipes and more than 100 photographs, Brooks Headley's Fancy Desserts has six chapters: "Fruit," "Vegetables," "Grains and Flours," "Chocolate," "Seeds and Nuts," and "Dairy." Recipes range from verjus melon candy to tofu chocolate creme brul e, fruit sorbet to eggplant and chocolate, showcasing Headley's unique perspective on ingredients and methodology. Guest contributors include philosopher-musician Ian Svenonius, essayist Sloane Crosley, and award-winning chefs Gabrielle Hamilton and David Kinch. 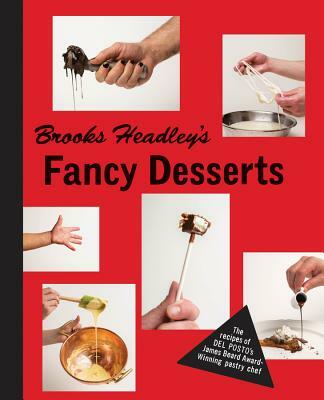 Brooks Headley's Fancy Desserts is an essential, inventive addition to the shelf of both home cooks and professional chefs.